There are 27 million cats and dogs in the UK, I think we can safely say we are a nation of pet lovers. That acuminates to 30-40% of all households in the UK having pets. Although most pets are very well trained from a young age, there are still many natural habits our pets possess that we may or may not be aware of… These can include; Chewing, scratching carpets and furniture etc, unsociable noises like barking and screeching, biting, drooling, begging AND fouling in the home. Even to a house trained pet, wool smells like other animals so they will be automatically drawn to it to mark their territory. 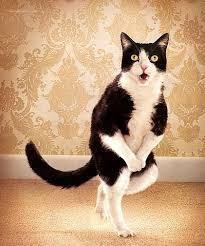 This is why wool carpets can be prone to pet accidents more than other carpet fibres. Cats and dogs like to make their mark in their territories, this is a natural instinct for them and as many Tom cat owners know, once a Tom has ‘marked’ his area, it can be almost impossible to remove. Also, most carpet warranties do not cover urine damage. Dealing with urine problems is never as simple as pet owners think or some ‘pet urine removal’ product manufacturers claim. Urine correction services and related costs vary by the degree of contamination and the price quoted may have to change in relation to the extent of contamination to be removed. There are professional carpet cleaners that can help with this, but it is a very specialised area and process and not something your ordinary carpet cleaner can normally adequately deal with, despite what they claim or tell you. 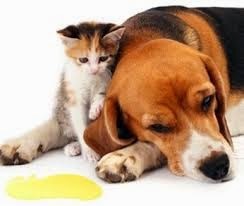 Pet urine consists of urea, uric acid, water, yellow pigment, cholesterol and enzymes. It starts as an acid when first released and then turns to alkaline (ammonia) as it dries. This is why you can get such a strong smell from pet urine. Obviously the strength and damage this can cause to your furnishings depends greatly on the age of the pet, the diet and whether it has any medical conditions. Humidity and heat will also amplify odour. The yellowing is caused by the yellow pigment and has a dyeing effect on fibres, this explains why the yellow stains are so difficult to remove from carpets and rugs. However, there are processes and procedures that can be taken to greatly reduce the staining, (although no one can guarantee to completely remove this type of stain), and neutralise the accident and make the area much safer. 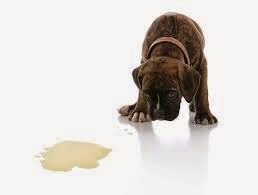 The simple truth is, Pet urine in carpets and rugs is NEVER simple to deal with. Unfortunately it’s not a case of just spraying the area with a solution and going over it with a carpet cleaning machine. Another important thing to bear in mind is the affected area may be the victim of repeated attacks by the lovable pet. Even though the stain may look minimal on the surface, the majority of liquid has gone into the base, backing, underlay and floor under the carpet or rug. In a carpet, this can be like a mushroom turned on its head, with the tip on the surface hiding a massive affected area you cannot visibly see. Think about it, the liquid has to go somewhere and spread. You can use an ultraviolet light or a high intensity light to locate the urine and even use it around the house when it is dark so you can identify any other areas affected. An electronic damp tester can detect the crystals in urine. pH testing may also indicate the presence of urine. So, the only real way to deal with this type of staining is to replicate the process of how it got there in the first place, with a product that is capable of dealing with the type of substance that is in there. This mostly involves completely flooding the affected area with the appropriate product, allowing it to work for enough time, very thoroughly rinsing the area and very quick extracting and drying. To correct colour loss, spot dyeing colour can be the only solution. Obviously, this type of treatment is very time consuming and can also come with its own risks to the rug or carpet, so a balance has to be made as to whether it’s worth going down this route, or if the rug needs replacing. If it’s an expensive rug or has sentimental value then it should be worth considering having this done, but sometimes the expense of going through this process or the effect it may have on the item might make it worth considering a replacement. If you have had a pet, or have pets soil on your carpets and rugs, I believe the very best advice I can give you is to seek a local professional cleaner that has a good track record of dealing with these types of problems. Use the comments box below to tell us your best solutions for removing pet accidents from your carpet or rug. Are You Fed-Up With Your Dirty Carpet?